Back cover blurb: Look after your daughter's things. And your daughter…" When a stranger asks Jo Blackmore for a lift she says yes, then swiftly wishes she hadn't. The stranger knows Jo's name, she knows her husband Max and she's got a glove belonging to Jo's two year old daughter Elise. What begins with a subtle threat swiftly turns into a nightmare as the police, social services and even Jo's own husband turn against her. No one believes that Elise is in danger. But Jo knows there's only one way to keep her child safe – RUN. C.L. Taylor's novels get better every time. Her Fourth is no exception. Jo Blackmore is easily startled. An agoraphobic suffering with extreme anxiety, after the premature death of her unborn son. she must stay strong for her two year old daughter Elise. When a stranger, Paula asks Jo for a lift, Jo's first instinct is to say 'No'. But Paula gets into the car anyway. She has a glove belonging to Jo's daughter Elise, and she knows both her and her husbands name. But how? She claims to have a Son loving on the same street as the Blackmore's but Jo is convinced that this is a lie, and a manages to throw Paula out of the car and avoid giving her a lift. Somehow she knows that this isn't the last of Paula she's going to see. After picking Elise up from nursery in an anxious state, Jo wants to call the Police, but Max persuades her not to. Jo knows he thinks she is being irrational because of her anxiety, but she does understand where he's coming from. Even if she doesn't agree with him. When Paula turns up practically on Jo's doorstep, Jo realises that both she and her daughter and in extreme danger. But who on earth is Paula? And what does she want with them? Max is no help, Jo knows that the more hysterical she becomes, the less inclined he is to believe her. Jo knows that she only has one option, to get away. But even then will she be truly safe? The Escape is a truly gripping novel that will make you question who you can really trust. Highly recommended. 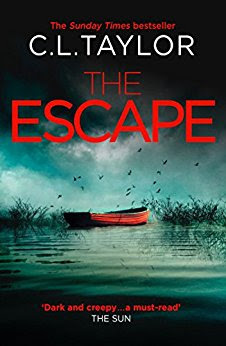 The Escape is available from 23 March 2017.